Hooverville Elementary School » Meet Our Staff » Intervention Specialists » Mrs. Laura Rooney » What is Fountas & Pinnell? The Fountas & Pinnell Benchmark Assessment System consists of a series of carefully designed benchmark books that measure the level of difficulty at which a student is able to read fiction and nonfiction texts. Each collection of texts are designed to interest and engage the reader while at the same time yielding important information for the teacher. 1. The teacher reads a standardized introduction. 2. The student reads orally while the teacher observes, codes, and analyzes the reader’s behavior. Within the Text – These questions check the student’s ability to decode words, search for and use information, and reach a literal understanding of the text. Beyond the Text – These questions check the student’s ability to make inferences; synthesize new information; make connections with content knowledge, background experiences, and other texts; and make predictions. About the Text – These questions check the student’s ability to analyze the text for aspects of the writer’s craft or critique the quality or objectivity of the text. Accuracy – the percentage of words read correctly and accurately. Fluency – how smoothly the student reads with expression and meaning. Self-Corrections – an indications of how the student self-monitors or self-corrects his/her reading. A 1:4 self-correction rate means that the students corrects or fixes approximately 1 out of every 4 errors made during the reading. 5. 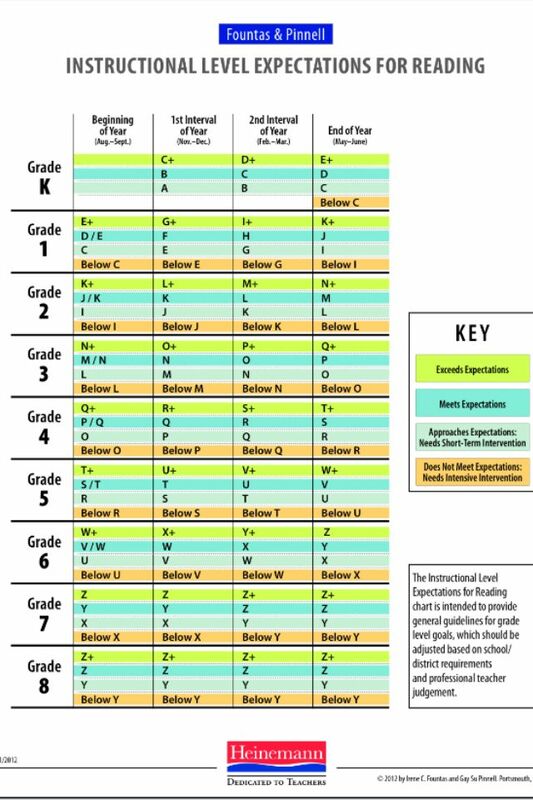 Based on these scores, the teacher determines the student’s instructional level for small group instruction. The chart below outlines the goals we have set for students at each grade level, throughout the school year.